Yet recently, some groups have begun speaking out against the idea of specifying these crimes as "honor killings" and providing targeted programs to address them, even as two subsequent events underscore just how urgently such funds and programs are needed. The first of these was the 2012 conviction of Mohammad Shafia, his wife Tooba Yahya, and their son Hamed in the murder of Mohammad and Tooba's three teenage daughters and of Rona Amir Mohammad, Mohammad Shafia's other wife in a polygamous arrangement – a case that received worldwide attention. That conviction confirmed the findings of a University of Sherbrooke study released earlier that year showing an exponential increase in the number of honor killings in Canada. Only three known victims were killed between 1954 and 1983. Since 1999, 12 women have died in honor killings. Yet according to a recent report from Women's e-News, many Canadian Muslim women now are speaking out against the government's new focus on these crimes, arguing that honor violence is no different from any other form of domestic abuse. Opponents of the idea call the projects "racist," and claim they put an unwarranted and biased focus on Muslim and Hindi families. "When women of color are killed, we ask these larger questions around their culture. We ask what's wrong with their entire people – their culture, their religion – instead of a particular person," Itrath Syed, who is pursuing a Ph.D. in "Islamophobia" in Vancouver, for instance, told Women's e-News. What is so tragic about this remark is not just the half-dozen or so ways in which it is patently untrue, but that it seeks to nullify the horror that is honor violence, to deny the profound distinctions between honor crimes and other forms of domestic violence and femicide. It is both absurd and disingenuous to suggest that all non-white victims and perpetrators of abuse are investigated on the basis of "culture" – particularly given the fact that the majority of Canadian domestic violence victims are Canadian Aboriginese. (In the U.S., too, most domestic abuse victims are black or Native American, yet questions of "culture" or "religion" are not addressed when dealing with those cases.) Culture doesn't excuse domestic violence whether the perpetrator is black, white or brown. What Syed really was referring to was religion, not race. Or rather, the implication that domestic abuse in Muslim families is related to Islam, and that Muslim families are therefore treated differently than everybody else. It's a common accusation, and an ongoing question: are honor crimes culturally-based, or founded in interpretations of the Koran? It's a bit of both, according to Carla Rus, a psychiatrist in the Netherlands who specializes in working with victims of both domestic abuse and honor violence. "Honor violence involves a kind of ideology, which you don't find in domestic violence," she points out. "In [Islamic] cultures, where church and state are not separated, it's difficult to distinguish whether honor violence comes through cultural or religious motives – culture and religion are inseparable in those cases." Moreover, not all domestic violence occurring in Muslim families (some of whom are white) is automatically categorized as an honor crime. But call a crime what it is. When Mohammad Safia curses his daughters for "dishonoring" and "betraying Islam;" when Iraqi-American Aita Altameemi's mother burns and beats her for engaging in "non-Islamic behavior" – and the family says they "are proud of it" – there is no reason not to take them at their word. Understanding how dramatically honor violence differs from other domestic abuse is, however, critical – a point that the recent Canadian funding aims to address, as do similar efforts in the UK and the Netherlands. As Phyllis Chesler, author of the landmark study, "Worldwide Trends in Honor Killings," has noted, "Westerners rarely kill their young daughters, nor do Western families of origin conspire or collaborate in such murders." Similarly, domestic abuse in Western families does not involve brothers murdering their sisters, as happens in cases of honor killings. To the contrary, siblings most often protect one another. Moreover, while domestic violence may relate to a man's sense of self-respect, reputation, or "honor" among his peers, it does not – despite what some Muslims argue – reflect his sense of religious honor or his sense, as patriarch, of responsibility for his family's perceived insults to his god. Yet it is precisely this mindset which incites much honor-based violence and murder – and not only on the part of the father or husband. Frequently, religious devotion and patriarchy places pressure on other family members – siblings, aunts, uncles, spouses or even mothers of a victim –to commit the act, often under threat. It is, in other words, a long-term family affair, and one that, unlike the problems of domestic violence, can be changed. Which is precisely why funding for, and attention to, understanding and preventing honor violence is so very critical, not only in Canada, but everywhere in the West. It is why women – and especially Muslim women – should be welcoming it, even demanding more. And yet, countless Canadian (and other) Muslim activists and apologists remain far more devoted to shaping public vision of their culture – even if it means disguising the truth – than to protecting the lives of their Muslim sisters. In some cases, they may go so far as to contend that the very notion of "honor killings" is a "Western propagated myth," reports Darpan. Indeed, one Muslim women's advocate, Rubaiyat Karim, told Women's e-News that, "Immigration policy can be very inclusionary and preach the language of multi-culturalism. But if we really want to talk about multiculturalism, we need to address the Orientalist mentality of government." She's wrong. What we really need to address is the refusal of some Muslim families to advance beyond medieval and barbaric religio-cultural practices – and to stop excusing them when they don't. Not to do so is to abandon thousands of women, not just in Canada or the United States, not just in countries like Pakistan and Saudi Arabia, but in every country, every city, every town across the world. We cannot let that happen. There is no such thing as "Honor Killings" These muslims should understand that when thay leave their country and go to another they must respect the laws of that country! If we go to their countries we have to respect their laws. Why Why aren't they made to respect ours??? Political correctness is such a strange and dangerous thing. Suddenly people who are entrusted with seriously important political positions, their reasoning abilities turn to mush. Islam is a closed religious, economic and highly political system of government which in no way shape or form could ever integrate with any culture other than it's own. Killing in Islam is commonplace. It is like a cancer growing rapidly in any country and when they grow to greater population, non-muslims will feel the pain of their strength. Lying and deceiving is common and expected in their religion (Taqiyya). We need people who will stand up to this evil and drive it out of our countries. Honor killing is not Islamic. There's nothing in Quran that says you need to kill for honor. Racism has to do with a hatred of a race,Itrath Syed, not a cultural decision or religion. People of religion are of all different races including Muslims. This sounds very ignorant and again the whinning of radical muslims so they can intimidate and drag their oppressive demands into Western culture where we have freedom to choose. God gave people rights to choose how they live not mandated by a religion. It is Christians that are persecuted, not muslims! Is there a call of racism against Christians? Please Itrath, take your thinking out of Canada. It is not welcome. A PHD in Islamaphobia? It should be more a PHD in Christianaphobia, really...check the statistics around the world and who is it killing Christians, muslims and other unbelievers? Muslims!!!! It is a ploy of evil to claim to be the victim and get sympathy. Independent, self-reliant, honest individuals do not need to do that. Their generous, righteous and kind lives speak for themselves! 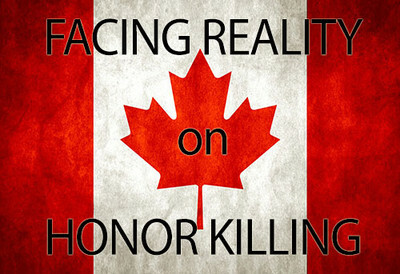 We made the mistake from the beginning labelling these acts as "honor killings" . They are nothing more than violent domestic attacks and rage fueled murders . Itrath Syed should be asking herself "what's wrong with me " ? As should the "many Canadian muslim women's groups " who would even DARE to try and defend , rationalize or re label atrocious acts of violence , abuse , and heinous acts of murder against their own "sister's " whose only crime at times may have been wanting to go to school !!! PH.D in Islamophobia ? no doubt on the tax payers dime . Next our universities and colleges will be handing out PHD's in Peadophilia !! As Winston Churchill so prophetically stated "islam is to a man what rabies are to a dog "